eFiling is the process of electronically filing your legal paperwork into the court system. When you submit a case into the court system, you must file your documents for your motion for consideration and approval by the court. Paperwork is submitted to the clerk through a process called court filing. However, with the legal field transitioning to digital technology, eFiling is becoming the preferred method of submitted your paperwork. Anyone looking to submit a motion to the court will need to file their paperwork. Typically, a process server, lawyer, or other legal support service professional files legal documents. Those who are representing themselves (pro se) can also file their documents, and eFiling can often be the easiest way to do so. If you are eFiling your documents, you will need access to a filing system (an electronic filing service provider, or EFSP), such as CourtFiling.net and to pay a small fee per filing. Do you have to eFile your legal documents? As the legal system catches up with technological advancements, more courts are turning to eFiling. There are already certain courts that have mandatory eFiling, so it is a good idea to research the requirements in your area. Otherwise, you can physically file them in-person at the courthouse. What do I need to eFile my legal paperwork? Look through your existing paperwork or contact the courthouse for help. eFiling typically costs anywhere between $3 – $8 per filing to submit paperwork on a platform like CourtFiling.net. However, filing specific documents in the court system have additional costs as assigned by the court itself. What format should eFiling documents be in? PDF files. PDF files are necessary as they are accessible across different computer operating systems. CourtFiling.net’s system can automatically convert the PDF files for you, streamlining your process. I have an existing case, can I still eFile? Yes, if your case’s court system supports eFiling, you will be able to file your paperwork electronically for an existing case. 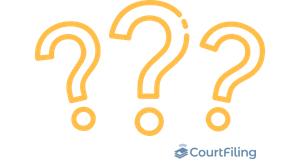 Simply sign up with a CourtFiling.net account and choose “File on Existing Case.” To tie your new filings to your existing case, you will need to input your case number. Your case number is typically located at the top of your previous case paperwork. If the system cannot locate your case number, try inputting the number without spaces or dashes. Why were my filings rejected? Paperwork is rejected by the county clerk often and for numerous reasons. You may have neglected to put in necessary information, put in the wrong codes, uploaded incomplete files, etc. Look for the explanation provided by the court and resubmit your paperwork with the corrections.